SOLD! Email me to special order (no extra charge). 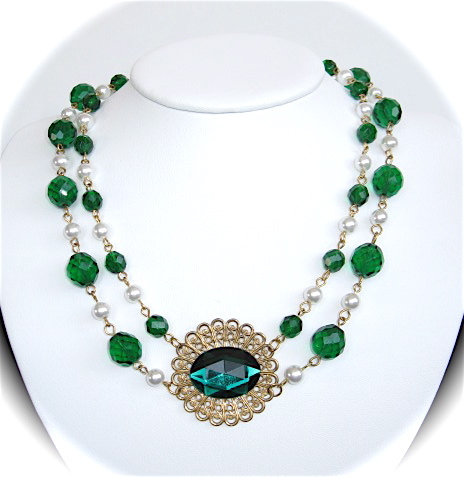 Glittering Emerald is an elegant, Renaissance-style necklace set featuring sparkling, faceted emerald-green Czech glass in two sizes, and lustrous white faux pearls. 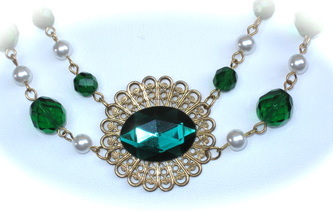 Set in the center is a lacy brass filigree carrying a large, faceted deepest green bead. The effect is impressive without being overwhelming. 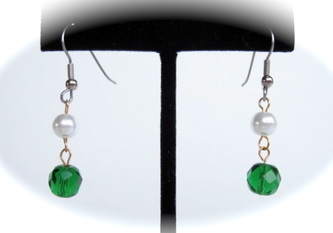 The necklace is 17" long, and the matching earrings dangle 3/4" below their surgical steel ear wires. This is a unique adornment; be prepared for lots of notice and compliments when you wear it!